How do I uninstall "The Big Mean Folder Machine"? "The Big Mean Folder Machine" is a simple application; there are no hidden components. Simply drag the "Big Mean Folder Machine" application icon to the wastebasket. My copy of "The Big Mean Folder Machine" does not run properly on Mac OS X 10.4. There's a separate download for Mac OS X 10.4 Tiger. The latest version of "The Big Mean Folder Machine" that is compatible with Tiger is version 1.5.1, which is still available from the download page. 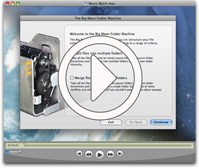 When you buy "The Big Mean Folder Machine", you always get all current and older versions, so if you are on Mac OS X Tiger at the moment, you'll be able to use unlock the Leopard version once you upgrade your operating system. When I run "The Big Mean Folder Machine" on Mac OS X 10.4 all options are grayed out. Version 1.3 mistakenly broke Tiger compatibility due to a development tool bug. This has now been corrected and the current version available from this web site is compatible with Mac OS X 10.4.